A huge thank you goes out to my past and current sponsors. Their products and involvement in racing is what keeps enthusiasts such as myself 'in the game'. The Central PA Region SCCA is my home region. I'm the Asst. RE, Chief of Timing, Reg, and Safety. Click to check out my home region! Find out more about how I got started as well as some of the ways I'm involved other than autocross itself. There's more to it than racing for me! Hello – My name is Cliff Moten and this site is dedicated to my love for SCCA Autocross and automobiles. I have been involved in SCCA and their autocross program since 2013. Most of my success has been in my 2013 Focus ST.
I’ve also had success with my 2018 Focus RS Limited Edition in both autocross and car shows (huge shout out to my wife for being so supportive, the RS is really HER car!). Aside from my autocross success I have also become a leader in my local SCCA Region. I tend to do as much as I can to make certain we are successful so that grassroots motorsports can keep alive and well! Here are some of my accomplishments over the years. 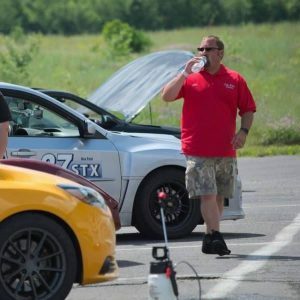 So now you may be asking your self…”Autocross, what is it?” Simple, it’s a sport which courses are created with traffic cones and cars are timed going around the course, fastest car wins. Really, at it’s most basic level that’s what it is. Events are held by local regions (such as the one I’m part of – www.scca-cpr.com) and is sanctioned by a main body called the Sports Car Club of America (www.scca.com). THANK YOU to my current (2018) Sponsors – Ground Control Suspension, EBC Brakes,Velossa Tech Design , Rebel Devil Customs and Mishimoto! I have a phenomenal suspension setup that has, no doubt, made a difference in the cars handling and predictability as well as fantastic braking which gives me more confidence than ever to push myself and the car to the limits! See results of the season (1st in class, 4th in PAX for 2017) here – www.scca-cpr.com.